Barefoot SOS believes that ancient herbal wisdom and modern science produce the best results when the strengths of both are combined. They use botanical extracts and plant based ingredients that have been trusted throughout generations for their therapeutic qualities, but they include them in advanced formulations developed by cutting edge scientists to deliver excellent quality products with superior performance. Barefoot SOS was founded on the principle of the body’s innate ability to heal itself. Many years ago Barefoot SOS started out when 2 friends with a love of natural medicine tried to find a natural solution to the head lice problem that their daughter was encountering at school. Because they were both natural health practitioners, they were aware of the strong chemicals normally used to treat this problem and set about creating their own product when they couldn’t find a natural alternative. 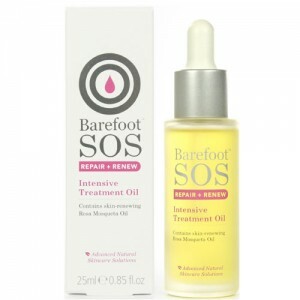 This first product (sadly now not part of the range) was so effective that they realised they had a talent as natural product formulators and they started Barefoot Botanicals, now known as Barefoot SOS. The name was inspired by the barefoot Doctors of ancient China who would walk barefoot from village to village treating locals with natural herbal remedies. Barefoot SOS makes fabulous products which really work, we love them, use them ourselves and frequently recommend them to our friends and customers! One of the main attractions of Barefoot products is the super effectiveness of their formulations and the sublime textures. We don’t believe that choosing natural products should ever mean making a compromise on performance and Barefoot SOS is testament to the fact that you don’t have to. They use unusual ingredients to deliver these exceptional results and don’t give up till they get it spot on, for example many of their lotions use something called Squalene (derived from olives) to give a gloriously silky skin feel and makes them an absolute joy to use. Barefoot SOS is one of the original truly natural skin care brands; their products are packed with organic ingredients, vitamins and antioxidants and they are formulated by experts in natural medicine. The products contain no parabens, paraffin / petroleum, propylene glycol, sodium lauryl sulfate, synthetic colour or fragrance. Anyone looking for high performance natural skin care with luxurious textures and a beautiful aroma would love the Repair and Renew (Rosa Fina) range from Barefoot SOS. The Barefoot SOS Dry and Sensitive range is perfect for anyone with dry and parched skin with sensitive, and perhaps those prone to eczema and psoriasis. It brings welcome relief to these uncomfortable skin conditions, whilst allowing you to feel pampered and cared for with lovely natural fragrances, unlike so many of the bland and unappealing emollient creams usually recommended for this skin type. Barefoot SOS products do not have any independent certification but they do use a very high percentage of organic ingredients and are completely free from parabens, sls, mineral oil, synthetic colour or fragrance. They are all suitable for vegans. 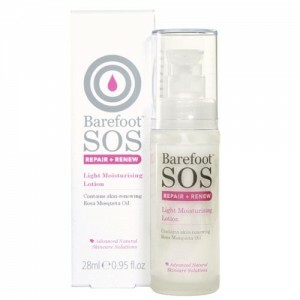 "I tried the Barefoot SOS cream you sent me - it is LOVELY!!! Perfect for my hyper sensitive skin." Debbie, London. The complete Barefoot SOS range - including Dry & Sensitive for those prone to eczema and psoriasis and Repair & Renew with rose hip oil to tackle signs of ageing.